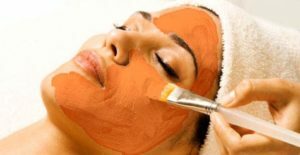 ­­­There are a variety of reasons people come to The Healing Station for facials, including addressing fine lines and wrinkles, treating skin conditions such as acne or rosacea and lessening the appearance of brown spots (called hyper-pigmentation) brought about by both aging and sun damage. To those who have never experienced one, a facial peel might sound like the frightening images you see in the movies or on TV sitcoms – a face covered with some pastel-colored substance with holes for the eyes, nostrils and mouth. But today’s cosmetic peels have no drama, comparatively speaking. They aren’t freaky and they don’t peel off. They are removed gently and evenly to show your skin’s natural glow, just hiding beneath the surface. Most of the peels you read about online are those offered by medi-spas or dermatology offices involving aggressive treatments using specialized devices. While the results can be good, these fairly costly treatments involve down time as the skin goes through a healing process, sometimes up to a week of ugliness before producing the desired results. Here at The Healing Station, we use natural peels contained in the Cosmedix™ product line to get results without having to endure some nasty side effects. Cosmedix™ peels (with appetizing ingredients such as blueberries, pomegranate and pumpkin) renew dry, dull and photo-damaged skin while offering you one of our most popular rejuvenating treatments. These peels penetrate the skin’s surface to thoroughly and evenly exfoliate the epidermis and reveal healthier, more youthful looking skin with a smoother texture and more uniform color. During the peel you may feel a very mild tingling or warmth as the solution is applied to the skin and for as long as it remains on your face. Once it has been neutralized, you will no longer feel the sensation. Immediately following the peel, your skin will look healthy and refreshed, enabling you to resume your daily activities with no down time whatsoever. We apply a sunscreen of SPF 30 or higher following your peel and ask that you limit sun exposure as much as possible for at least a week. Who gets facial peels? Almost anyone teen through adult age with dry, dull, or drab skin looking to brighten his or her complexion is a good candidate. Individuals with the skin conditions we mentioned or fine-to-moderate wrinkles, age spots, pigmentation problems or sun-damaged skin will benefit from two or more peels over a designated period of time. When done routinely with care taken between sessions, results can be deeper than micro-dermabrasion at a fraction of the price. For more information about our peels and the Cosmedix™ line of products, contact us at 916.294.9980. Call us now to set up an appointment for an absolutely GLOWING spring!